A hands-on approach can sometimes save a few dollars on small jobs around the house. But to repair a garage door is never as easy as you might think. For one thing, the panels are often very heavy, and the springs that support and pull the door's weight can be extremely dangerous when mishandled. If your door is in need of repairs, you're way better off calling our professional technicians. It takes high levels of skill and years of experience to repair a garage door properly. Our technicians are well versed at dealing with all kinds of issues, including broken cables, damaged panels and a door that got off track. Whatever the problem, we can find a solution. Due to the wear and tear that the system suffers through on a daily basis, some problems can be inevitable. The act of adjusting cables, realigning tracks or replacing panels can be incredibly dangerous, as an inexperienced amateur can get seriously hurt if these parts are mishandled. 400 pounds. That's how much the average garage door can weighs. Imagine then, the latent power of the springs that, day in and day out, lift and raise the door. These components are under an enormous amount of stress and if they break they can launch themselves across the garage and seriously injure anyone that gets in their way. Our technicians can perform the required spring replacement quickly and safely, and make sure that the door is properly balanced and doesn't leave any gaps while closing. Part of the reason why we've started to offer emergency repair services was to be able to help local homeowners with dangerous issues that required a fast response. We'll make sure to get to you as quickly as possible and deal with whatever the problem is immediately. 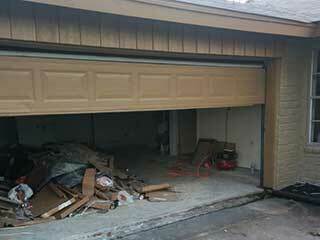 Contact Garage Door Repair Sacramento today and let our specialists fix everything.